Future fights of the year but will they happen? By Gav Duthie: This is an article about fight of the year candidates. Some of them will be the biggest fights financially that we can get but this isn’t about that. This is about the fights that will be amazing to watch, action packed. Can we get some of these, get fans on the edge of their seats. Here are my five of the best including why or why not we might see them. This is the biggest fight that can be made in boxing right now. The annoyance of fans that this isn’t happening right now is actually helping to build anticipation for the fight. This is not just the biggest fight commercially but it has to be a great fight to watch. It won’t be anything like Wilder v Fury. This contest surely has to end in a knockout. I think Joshua will try to box and stay away from that right hand but he is not a defensive fighter. It will be a case of who lands first. I can see a Lennox Lewis v Michael Grant situation where both will go at it and one will fall early I am just not sure who. I don’t see this happening this year to be honest. 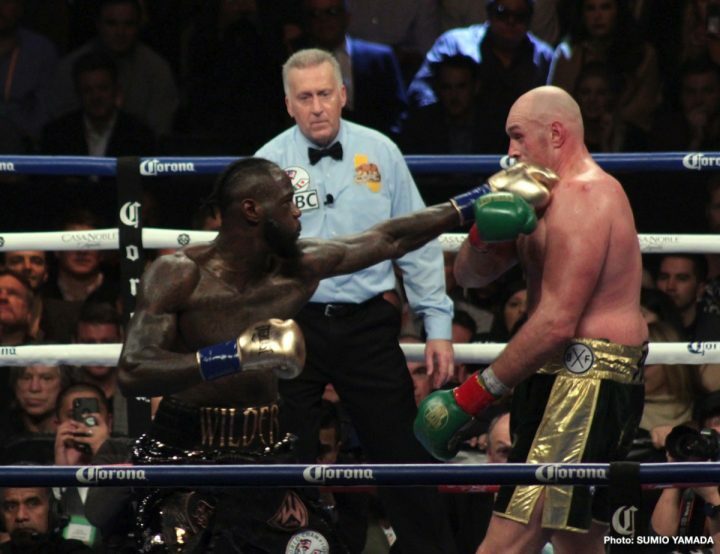 Wilder and Fury look set to rematch and the talk is that AJ will make his American debut in June against Jarrell Miller. If this is the case then it is highly likely that AJ will have Kubrat Pulev as an IBF mandatory obligation later on in the year. I doubt this will happen either. If Miller fights Joshua he would need to win the fight for a chance of him defending against Whyte. I just think that this would be a high action contest. Miller is a bit like a younger, better Dereck Chisora and would pile the pressure on Whyte. I can’t see Miller defeating Anthony Joshua if that fight happens but these two could certainly create fireworks in the ring. I would favor Whyte in this to be honest. He has really had to dig deep in his two fights against Chisora and Joseph Parker and I’m not sure Miller could handle the pace. Manguia must be the most active champion around just now. He is fighting on average every 3 months. Even in facing a tougher than expected opponent last time out he is still scheduled to come back in April. The big talk was a unification between Hurd and Charlo but given that he lost to Tony Harrison a rematch is his priority. Hurd just never stops and Manguia is action packed. If Jared Hurd can get a fight of the year contender out of the usually pragmatic Erislandy Lara then one against Manguia would be fireworks. Somebody’s 0′ has got to go and I think Hurd would outwork him and win the fight. After Manny’s win over Adrien Broner many are asking what next? For me he has 3 options and not all of them viable. The Floyd Mayweather Jr. rematch seems to be a favorite but Floyd has dismissed this and it seems to far gone. He can make another run at dominating a new era which means fighting the likes of Thurman, Spence and Crawford. This might take too much time but Thurman’s poor performance against Josesito Lopez has got people talking. The other option is one last super fight. Lomachenko could be the best fighter around post Mayweather so this could be a technical masterclass. Lomachenko had previously said he didn’t want it, Manny’s time had past and he didn’t want to make a name for himself beating a fighter past it. Pacquiao’s past two wins against Lucas Matthysse and Broner might have changed his mind. Now the logistics. Pacquiao is currently fighting two divisions above Loma. The contest would need to take place at 140 lbs. Pacquiao has said he could make that easily in the past. Loma has said he is struggling to acclimatize to 135 lbs so he may feel its a big risk. I believe Loma would win for what its worth. This fight could just be amazing to watch. Warrington has won his last two fights by relentless stamina. I thought both Lee Selby and then Carl Frampton’s movement and skills would lower the punch output of Warrington allowing him to be out-boxed. It didn’t happen. He fought his fight both times and his opponents couldn’t handle it. If anyone can handle it, it would be Oscar Valdez. A skillful but tough Mexican who basically fought a welterweight on the night in Scott Quigg (who didn’t make weight) and won with a broken jaw. This mentality would be required to derail Warrington. It would be non-stop action for 12 rounds and the winner will go through hell to unify the titles. I would pick Valdez to win but I’ve been wrong with Warrington before. Boxing » Anthony Joshua » Future fights of the year but will they happen?